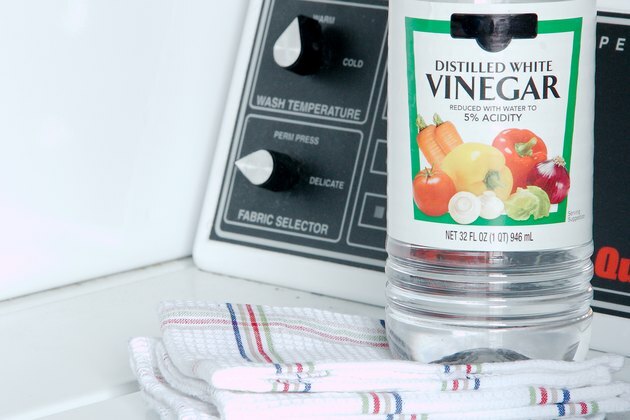 A sour-smelling dishcloth may be the last thing you want to use to wash your dishes -- after all, if it doesn't smell clean, it may be putting bacteria or germs into the dishwater and onto your dishes. If dishcloths smell dirty even when fresh out of the dryer, it may be time to adjust the way you wash and dry your kitchen linens. Frequent washing, with an occasional odor-removing substance such as vinegar, helps remove those foul smells. Dishcloths come into contact with all kinds of food substances, including oils, that may become trapped within the fabric. Forgetting to rinse the dishcloth out after you use it allows some of those food substances to be left behind, contributing to odors. Leaving a dishcloth wadded up after use may cause it to dry with a stale smell, as can overfilling the washing machine and dryer with too many items at once. For a washing machine to thoroughly clean your kitchen linens -- or any laundry, for that matter -- the items being washed must have room to move around. Otherwise, they may not be washed entirely clean and the laundry soap may not rinse out completely, also contributing to potential odor issues. Folding and storing dishcloths while they are still wet may also add to a stale odor if you store them in an airtight environment or a drawer with little chance for airflow. Wash kitchen dishcloths and hand towels in the hottest setting on your washing machine. 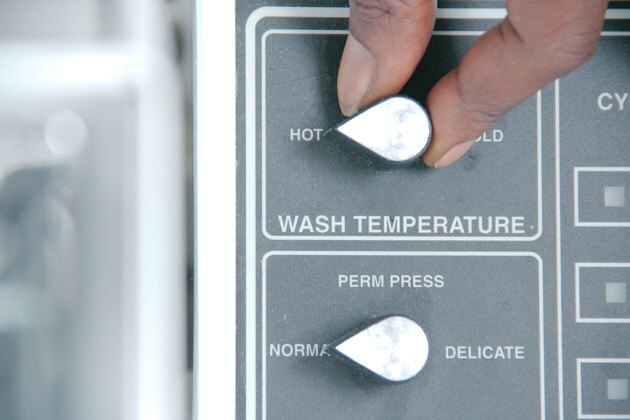 Hot water helps kill germs and bacteria trapped in the fabrics. Dry the items on a high-heat setting as well, making sure they are completely dry before putting them away. If the dishcloths smell sour even after you've washed them, give them a special odor-removing treatment with vinegar, then baking soda. Fill the washing machine with hot water and a full load of dishcloths and kitchen towels. 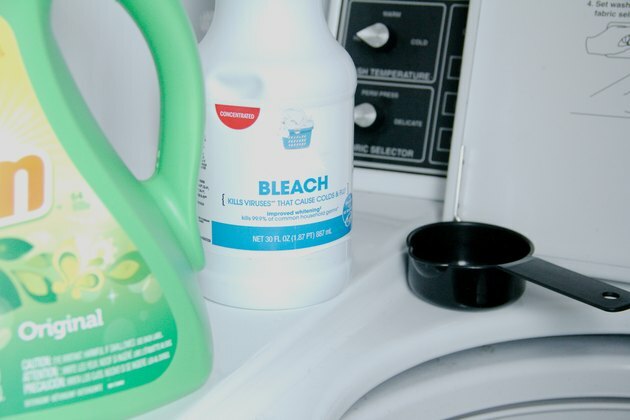 Instead of laundry detergent, add 1 cup of white vinegar to the machine and allow it to run through the wash cycle. After the water drains, fill the machine with hot water again, this time adding 1/2 cup of baking soda or borax. Allow the machine to complete the final rinse and spin cycles, and then dry the kitchen linens in the dryer on a high heat setting. A dishcloth that has been wet and dried several times between washings may harbor bacteria that contributes to a less-than-fresh odor, even after you wash it. Sanitize those stinky dishcloths by washing them in hot water with your usual laundry detergent, along with 1 cup of bleach. 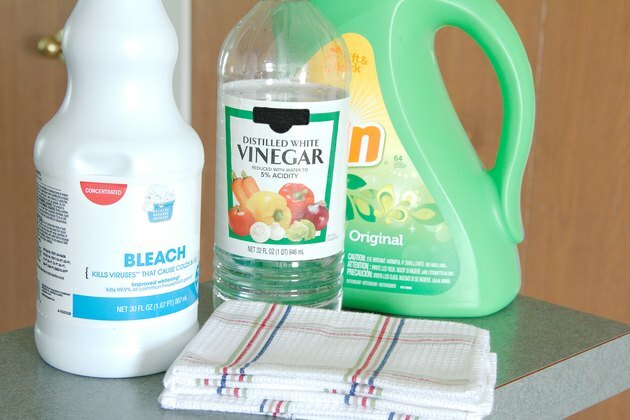 If you're concerned about bleaching out some of the color on dyed dishcloths, use a color-safe bleach instead. Can I Leave Damp Clothes in the Washing Machine Overnight?